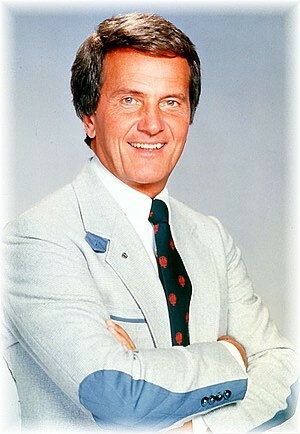 Pat Boone was one of the most commercially-successful musical artists of the late 1950’s. He spawned numerous Top Ten hits, including an impressive total of six songs that reached #1 on the U. S. charts. As his core audience began to age, and tastes began to change rapidly in the mid-1960’s, Boone wisely transitioned into a lucrative (albeit smaller in scope) career as a Gospel and country artist. His emphasis on Christian music earned him a fanbase that was less “pop” and more “mom and pop.” It also earned him a place in the Gospel Music Hall of Fame. That served him well as he aged, maintaining him as a viable niche artist who could consistently sell albums to audiences who also enjoyed country and western music. As a result, Boone would promote his material on shows directed at those folks who were kindred spirits as it pertained to Gospel music, and who were also old enough to remember his heyday. One such appearance took a turn for the awkward. While doing a guest spot on a program called Music City Tonight in the mid-1990’s, Pat Boone decided to entertain the panel and the audience with some Will Rogers-style rope tricks. Early on in the proceedings, said lasso actually knocked the unsecured toupee from Boone’s balding head, sending him scrambling to recover the wig while the crowd, hosts, and guests shrieked with delight. Co-host Lorianne Crook could neither look nor stop laughing. The other co-host, Charlie Chase, attempted to assist by offering a stuffed animal with which Boone could cover his exposed scalp. Boone did his best to downplay the incident, even going so far as to borrow Aaron Neville’s hat to try to bring the conversation back around to Will Rogers. But the crowd couldn’t stop laughing at with him. Boone never quite recovered, eventually taking his music to some dark and inexplicable places before settling into a career as a minor spokesman for various products and services as his audience began gradually to pass on to the next life. Although the toupee incident may not have been the true catalyst for these strange twists and turns in Boone’s career, it’s fun to think it could have been. Although this show was hosted by Lorianne Crook and Charlie Chase, it is not to be confused with Crook and Chase, a show that was the precursor to . . . this footnote is boring me, and I’m the one writing it. Wait . . . Aaron Neville? What the hell? Say what you want about Boone, but he was right on the money (no pun intended) about gold. $550 an ounce?!? This laptop would be diamond-encrusted had I just listened to him back in 2006! This entry was posted in Commentary, Television, Videos and tagged Awkwardness, Commentary, Hairpieces, Music City Tonight, Pat Boone, Television, Toupees, Videos, Wigs. Bookmark the permalink. From that clip it’s obvious that his homophobia is a defense mechanism.